8 pieces 8 - in the Spring 2011 Wylliams/Henry show - and some of them hard-won. 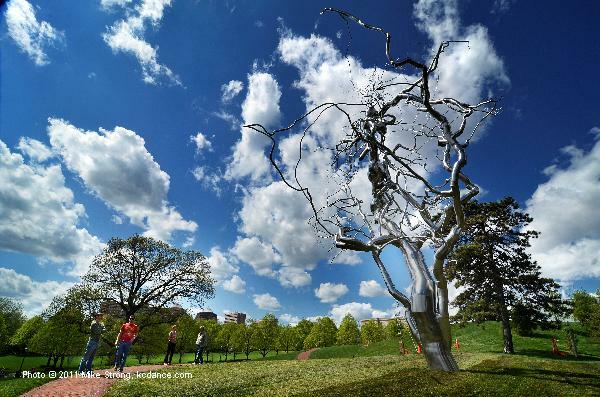 Prior to the spring concert, four of the pieces were part of a small concert at the Nelson-Atkins Museum celebrating the aquisition of a new sculpture, "Ferment" by Roxy Paine, a "Dendroid." Or as most of us will call it, a tree. For that piece Mary Pat Henry created a new work, "Ferment" based around the growth process of the sculpture itself and of the organic growth represented in the sculpture. "Ferment" by Roxy Paine - in place, with fresh re-sodding done and visitors along the walkway. Another version,. with a little Photoshop I gave the "leaf poor" "Tree" some badminton-racket leaves and from another shot, a badminton shuttlecock root system (the "root system" is a small tip of the hat to Jerry Uelsmann). Sorry, all, just couldn't help myself. The very friday evening, before the sunday show at the Nelson, during studio rehearsals for "Blue," dancer Erik Sobbe came down from a leap a bit wrong and turned his right ankle. He was out of that show and the entire small Nelson concert, including the "Ferment" piece had to be re-worked. Erik was in all of those pieces. But they did get it done, and even with a stage clearly not setup for dancers or a lot of lighting, the crowd at the Nelson was enthusiastic and did a standing applause. And this was with a company, litterally slightly hobbled. A mere two weeks after his injury Erik will be performing again. He looked strong in rehearsals. For the company the entire eight pieces show a range of ability and concept. Wylliams/Henry is a small company with a deep variance of material from social commentary to organic movement to comedy tinged with drama. The dancers come together from both the KC area and across the country. Some of the dancers came through the UMKC dance program as are some of the crew hired in for the show. Erik Sobbe, in dress thursday, in Blue, the same piece he was injured in during rehearsals less than two weeks previously. At bottom, turned away, is partner Ashia Myers. Blue - by Paula Weber - Ballet for three couples - alternating between duets, all three together, and one couple as lead duet with the other two couples paired together in separate moves. Pretty and charming. Laddertime - by Paula Weber - started out in the March 2010 show at The Edge Gallery as a filler, literally a side show, off to the side of the audience prior to performance and during the half. Very slow movements and poses by two dancers. Not as easy as it looks. Esperando en Silencio - by Mary Pat Henry - dramatic piece giving us the mothers of the disappeared in Argentina and their agony. Covers a lot of ground and a lot of emotion. Session For Six - by Anna Sokolow - a new piece for Wylliams Henry - Jim May, was here a couple of months ago to set the piece on the company. A 1958 piece, It depends on counts which change for its timing. Very NYC city based in terms of young persons and their chance meetings as a result of individual activities. Ferment - An organic piece, emulating the growth in nature of branching structures (those dendroids). 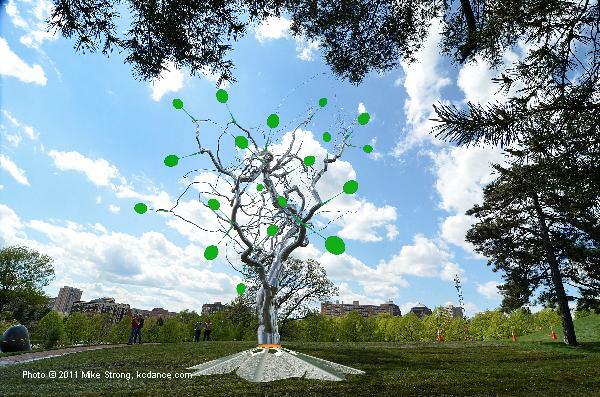 All new, commissioned for the Roxy Paine (not a tree) sculpture, "Ferment."